The Aspen real estate market is firing on all cylinders at full speed ahead. By all measures - property dollar sales, property unit sales, real estate transfer tax collections, and construction activity - we are in the midst of a thriving and vibrant real estate market. We are seeing expanded Aspen sales activity outwards from downtown Aspen to Starwood, Woody Creek and Old Snowmass as buyers recognize the significant values 5-15 minutes outside compared to record prices within the Aspen Core. Snowmass Village sales have been fairly even for the past 3-4 years but hopes are high for a substantive bounce as the Base Village experiences new construction momentum and gets closer to completion. This is a result of the ownership change in Dec 2017 from an indifferent Related Co’s to a highly charged and enthusiastic local East West Partners/Aspen Skiing Co partnership. (See photo of construction progress on Pg 25). Download full 32 Pg report from link to right. 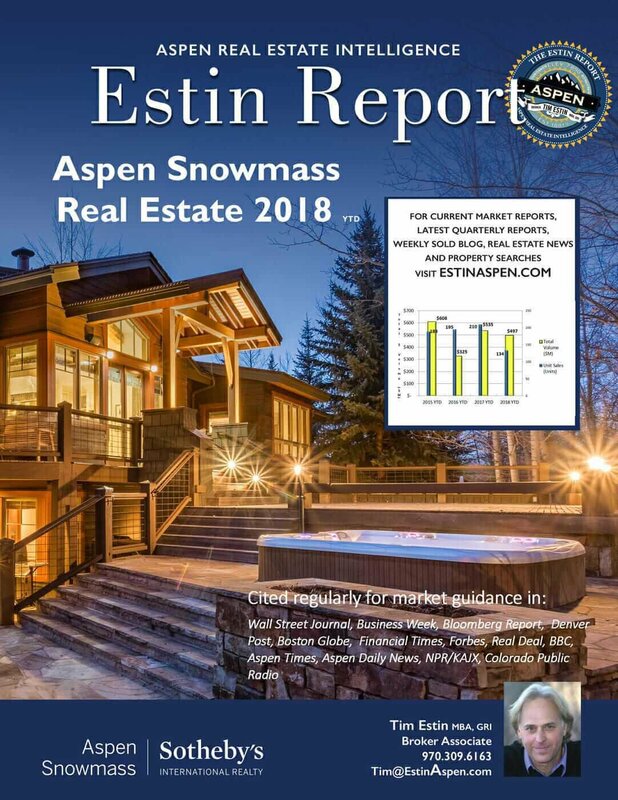 The Estin Report: Feb 2018 Market Snapshot Aspen Snowmass Real Estate is a 10-Page statistical breakdown of monthly and year-to-date sales in detail. The Monthly Snapshots are posted on or near the 1st Monday of the month. It is the only monthly Aspen market report to be published in a consistent and timely manner. Yodel from the Mountains of Aspen - where the winter snows of mid-to-late Feb finally arrived giving us superb powder skiing after a dispiriting Dec – Jan drought, where the real estate market is super active and where everyone wonders how long this nice ride will continue. With many economic metrics in record territory, prognosticators on the national level say we may have two years left (Dr Elliot Eisenberg at an Aspen Realtor Lunch on 2/22/18. See presentation.) - fueling it are tax cuts, increased government spending, still low interest rates, low unemployment, stable GDP, growing world economies and a record stock market. There is consensus that we are in uncharted waters across the board. In Aspen, our present up-cycle is now 8 years old, the 2nd longest on record since 1976, according to Randy Gold of Aspen Appraisal Group. The recent Feb. 2018 stock market correction was déjà vu all over with early 2016 when the Dow tanked due to plummeting oil prices and hyper worries of a China slowdown. That event triggered the severe 9-month election year fall-off in the local real estate market up to Nov. 2016. Since then, our market has recovered to near record 2015 levels. Activity has been largely fueled by high demand for Aspen real estate inside the roundabout - which proved itself highly resilient and liquid during the Great Recession - and that focus continues unabated today. But also, at long last, smart buyers are recognizing and snapping up the far superior values outside the roundabout. In general, optimism rules even though there are any number of macro events that could spoil the day – Korea, the budget deficit, national debt and other factors unknown. Sales activity for the year through Feb 2018 is up 30-35% over the same last year.